My apologies to my fellow DE'ers for my lateness on my two convention reports. I've been currently planning my escape from Maryland to the Rochester area and it's been soaking up my time. That aid, I do have a few things I few I need to let out. You see, in the month of September I had the pleasure of attending two conventions. As noted in previous reports, I attend with my girlfriend Laurie and help out at her Knit Terrors table, which seems to be a real big hit amongst con-goers. That's definitely given more purpose in attending conventions other than running around buying bootlegged copies of Sid and Marty Krofft productions. So, imagine my joy when I found out that Horrorfind Weekend in the world renowned battlegrounds of Gettysburg, PA is on the weekend of my birthday, I got super excited in record time. After all, what better way to spend the weekend of my birthday than spending it at a horror convention with my girlfriend and my friends? It can't be beat! It's a win-win situation. 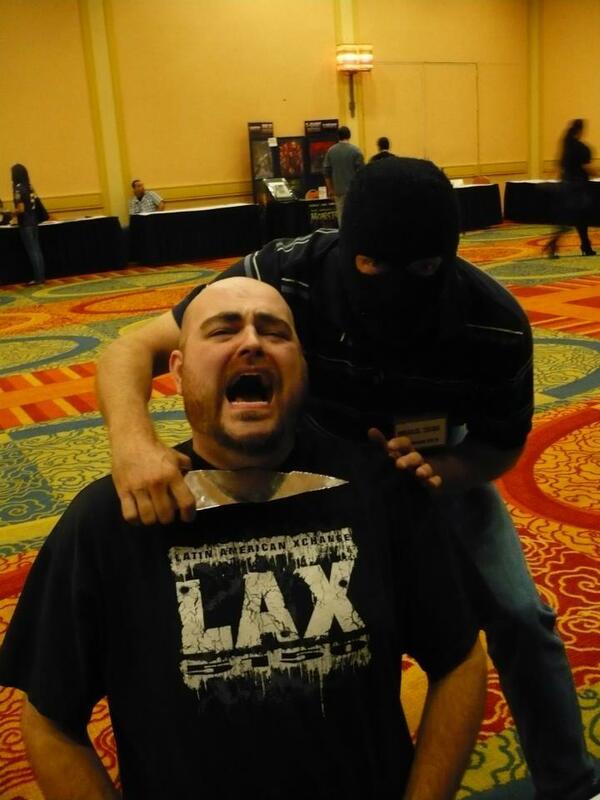 Besides, after attending my first Horrorfind in 2010, I had an absolute blast, so I was expecting to even more fun now that I was staying the entire weekend. The best part, is Nicole Fiss wasn't there to drool over any of the guests. It got even more exciting for me when my hero Rowdy Roddy Piper was announced as a guest. Actually, a funny twist of fate, I was on my after picking up a Roddy Piper doll on clearance at Target when Laurie texted me with the news. I almost caused an accident when reading my text at the stoplight. Thankfully, that didn't happen. But it came close. So with the elements of Roddy Piper, meeting Amanda Wyss for the first time, a birthday celebration with horror royalty in the form of Kristy Jett of Fright Rags and the masterminds behind VHSPS, how can I lose?!?! Monday before the convention, an announcement that Roddy would be unable to appear. Panic started throughout the Horrorfind fandom and people demanded answers. Even I asked questions and was rudely shouted at for asking with a famous "we'll let you know when we let you know!". The verbal shenanigans with Horrorfind continued until about Wednesday or Thursday before the show, finally confirming Roddy's appearance. I was able to be rest assured that he would be there which made my attending so great, (details in a second), but I felt that maybe the staff could have handled the fans questions better. So, Thursday came and I, excited as heck, came to the hotel. I was staying with Laurie, Kristy and Sean of VHSPS where we partied like maniacs. We stayed in the secondary hotel for the weekend which was a very nice hotel and very large. No complaints there whatsoever. More tomfoolery began as Friday morning we were informed that Horrorfind did not have all of our passes. This was taken care of, but it's a situation that shouldn't have happened. After checking in we go to our table which we were stationed next to Horrorfind cover artist Joel Robinson(which made the weekend go by quicker.). Our table, however was pretty tight and compacted and no room to move around at. Maybe I'm spoiled here, due to at Monster Mania, we're at a table that we have enough room to camp under but I digress. In addition, the dealers room was about as large as a McDonalds dining room. Not exactly the ideal size for attendees to walk around and shop in a comfortable fashion. It was a very unomfortable spot for those looking to score a rare piece of memorabilia. On the other hand, there's the guest room. For some, it's the end all be all reason to attend conventions. And why not? Where else can some say they can meet their favorite horror stars? A huge draw to any convention will always be a good guest list and this show had a pretty impressive guests list, I must say. Roddy Piper, Amanda Wyss and Lisa Wilcox were the guests I wished to meet. But for those who didn't care for my list, there was plenty of True Blood guests including Sam Trammel. William Sanderson of Blade Runner fame, Brian Thompson, Julian Sands, Jill Schoelen and more were in attendance as well. Convention mainstays Bill Moesely, Conrad Brooks, Ken Foree and Sid Haig also showed up. For the first time, Sid Haig was taking special photo ops in full Captain Spaulding makeup and costume. Definitely a special keepsake for those who purchased it at the hefty price of 50 bucks, but everyone said it was worth it. No complaints about the guests whatsoever. All the guests that I was able to speak with seemed in high spirits and thoroughly enjoyed themselves. Everybody was absolutely approachable. Even Ken Foree who has a notrious reputation for being rather unfriendly at times seemed to be in a good mood as we discussed his time on Kenan and Kel. As I said the big name for me was Roddy Piper. I got to meet Roddy this time for the third time, and everytime he's just as nice if not nicer than the last. Roddy has always been a hero of mine, and I explained to him how much he reminds me of my late father and he was very touched by hearing it. He gave me a big hug and a handshake letting me know how much my kind words meant to me. Roddy always takes interest in those who come to meet him, even wanting to know where they come from, their love of horror or wrestling, the story behind what merchandise they bring and so on. Roddy was a huge highlight for me this weekend, and I look forward to meeting him again! 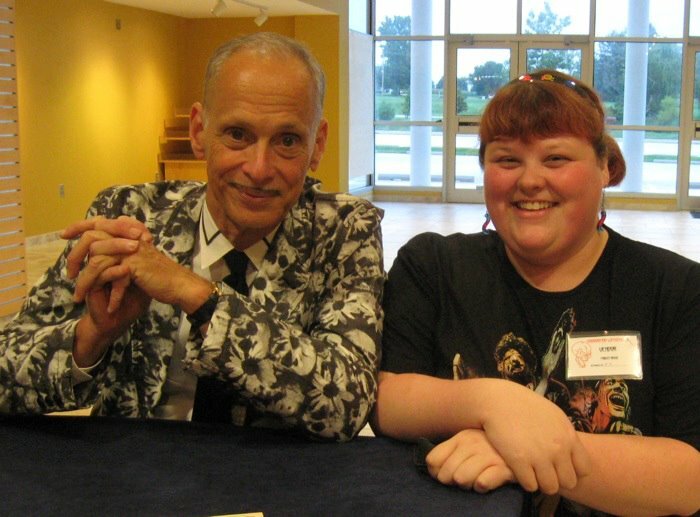 Of course, as much as I considered Roddy THE name for the weekend, a lot more fans came in droves for legendary director John Waters who took time out of his very busy schedule. Of course, meeting him came with more complications. 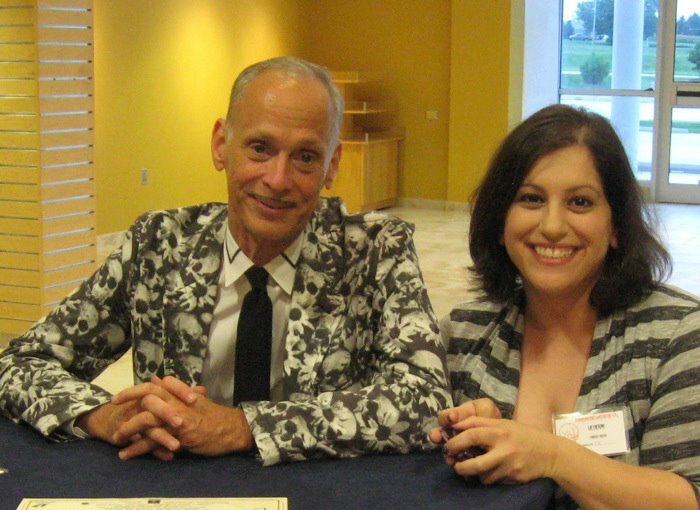 Earlier in the week, a post had been made saying that a lottery for meeting John Waters would be instituted. At the registration line, fans would pull a ticket out of a hat and if your ticket said "JOHN WATERS YES" then you were given the right to be in line for John's two hour appearance. If you got one that said "JOHN WATERS NO", then...well, sorry. So, with four vendors passes, I was given the opportunity to pick 4(even though I did take 5 "by accident"). You see our dear friend Kristy Jett is such a huge fan of John Waters, all she wanted to do to get through this already rough weekend. So when I came back with TWO "JOHN WATERS YES" tickets, she immediately became overjoyed! . And of course, Laurie got the second ticket, so I was very happy to see both of them happy! All the tickets were taken and the fans who had them were done almost an hour before scheduled. So, now the rule was "anyone who wants to meet him can before 9 pm.". This caused a lot of anger from fans and rightfully so. First they tell fans they have to take a ticket and then they give the rule "oh yeah just go for it"? They're messing with the fans and it's absolutely not ok.
Gotta end on a good note somehow right? Now this show was pretty darn special. Aside from being the 20th Monster Mania, it had a guest lineup that would make diehard fans drool. The guest of honor was none other than MR. JOHN CARPENTER. Considered by many to be one of the greatest directors in the history of film, Mr. Carpenter has made his name scaring the crap out of us for so many years with his twisted creations including Christine, The Thing, They Live and...well you may have heard of him, MICHAEL MYERS. This weekend was also graced with the presence of many Halloween alumni including most all the men who played Michael Myers. Ironically Tony Moran did NOT show up. Also were the stars of Halloween including Tom "THE MAN" Atkins and total sweetheart PJ Soles. Also in attendance was the one and only Jefferey Combs of Re-Animator fame, Joe Turkel from the Shining, Michael Tough who is known as the killer in the original Prom Night made his first USA convention appearance alongside Zack Galligan of Gremlins fame, Clare Higgins from Hellraiser who also made her first convention appearance along with fellow D-E writer Nicole Fiss' object of affection Tony Todd showed up for a repeat appearance.. Among these guests and 80s icon Anthony Michael Hall, was the normal smattering of the Walking Dead and True Blood guests. Yessir, if you're a diehard fan, this was the show for you! 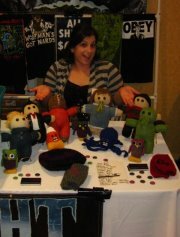 Just as I mentioned in the Horrorfind review, I spent most of my time at the vendors table selling the goods. But I was able to have a little time to run around and meet some great guests. The guests were very open and very happy to be there. 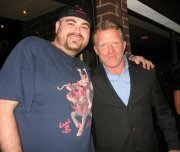 The general feeling and vote of "MVP of the Show" was Anthony Michael Hall who could be found in the bar gladly taking photos and chatting up with fans. After talking about his experience on Tales From the Crypt(I like to talk to stars about their experiences on Tales From the Crypt. It's often eye opening and very shocking! ), I got a quick photo with himself! I can never stress the importance of fan interaction with stars at conventions. It's a very important aspect of the show. As stated before, many fans swarm to the shows in hopes of catching a photo or autograph from their favorite star. And most times, these experiences can make or break the convention for fans.But, it seemed fans were very happy with all the guests they met. A perfect example of this was the 30 minute conversation I had the pleasure of having with Mr. Joe Turkel and Michael Tough about sports. Movies barely came into it, and it seemed that movies didn't even exist! We just chatted away like old friends talking about our favorite teams and players. A real great moment that I will never forget! Now, as I said before, the main draw was John Carpenter, who many fans consider to be a "movie god". Now, I'd never compare anyone to a "god status", but this was a very big deal and I can understand why fans were excited. Mr. Carpenter is one of the biggest and most highly regarded directors of modern cinema who's always coming up with a new creative way to scare us and it's always a true honor for me to meet the directors who made my nightmares happen. I got in line for Mr. Carpenters on Sunday when his line was dwindling, which is normal for a Sunday at conventions. I got in line mostly to show him Laurie's Knit Terrors Michael Myers which he enjoyed. Another fun moment for me was talking to him about wrestling, as he appeared years ago on a WWE produced dvd talking about Roddy Piper's career in Portland in the 70s. I got to briefly chat about wrestling with him, but he seemed rather happy to discuss something other than horror movies. I quickly got a photo with the man, shook his hand and sped off. FYI-For wrestling fans, Mr. Carpenter told me his favorite wrestlers of all time were a tag team called "The Medics"! A very memorable Q&A session with John occurred Saturday evening. In it, a fan asked about Escape from Los Angeles, to which Mr. Carpenter responded with a mighty "F$%^ YOU! ", resulting in fans applauding and cheering. And somehow, Laurie still took me back home. Why, I don't know! One of my other "must meets" was Mr. Jefferey Combs who I did not get a photo with. But I did bump into him on the escalator and said "Good morning Mr. Combs". Jefferey, with a grin, looked at me with his Herbert West eyes and voice responded "The name...is Jeff. JEFF.". I'd be lying if I didn't say that was a huge geek out moment. Now, aside the guests, partying is a big part of Monster Mania. One can be up until the wee hours partying, drinking, hanging with celebs. Heck, I even had a great numerous hour conversation with Elm Street 5 actor Danny Hassel in August 2010. It's very easy for people to get swept up in the moment and having a lot of fun. Personally, since I'm not a drinker, I'm not normally up that late unless I have a great reason. This particular time though, I was up until about 4 am just hanging with friends and being very worry-free. 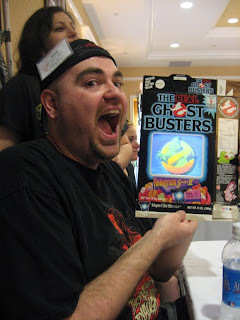 It's a great close bond that many in the Monster Mania convention have with each other. Many consider Monster Mania to be not just a convention, but a family. And they would be one hundred percent right. You can't walk down the halls without bumping into people you know via previous conventions, the famous MM message board or whatever. Having people introduce themselves as people I only knew on message boards is a very fun experience, as well as the friendship afterwards. Did you know that you can create short links with Shortest and get money from every visit to your short links.